Acon Digital Equalize 2 is a parametric equalizer plug-in that combines unique features with excellent workflow and an intuitive user interface. Unlike other equalizers, you can freely adjust not only center frequency, gain and bandwidths, but also the filter slope for each band. The filter slope can be set anywhere from 3 dB to ultra-sharp 120 dB per octave. Needless to say, you can operate Equalize as a zero latency plug-in when using the minimum phase mode or choose to preserve the phase relationships in the linear phase mode. Equalize goes one step further, though, and introduces the unique mixed phase mode that allows you to set the latency freely in the range 5 to 120 milliseconds while preserving the phase relationships as far as possible. That gives a unique control over potential pre-ringing artifacts which is a common problem with linear phase filtering. Latency values below 20 milliseconds ensure that any pre-ringing is masked by the temporal masking of the human hearing while preserving the time-alignment across the audible frequency range. Great care has been taken to provide a user interface that is straight forward to use. Band parameters can be adjusted using handles directly in the graphical representation of the frequency response, including bandwidths and filter slopes. A flexible real-time analyzer lets you monitor every aspect of the processing. You can easily switch between full, mid, side, left or right channel processing for each band and Equalize automatically routes the audio signal internally to ensure the best results and lowest possible latency. Eight different band filter types — low cut, low shelf, peak, tilt, bandpass, notch, high shelf and high cut. Up to twelve independent bands. Freely adjustable gain, frequency, bandwidth, resonance and filter slope. Three different phase modes, including the novel mixed phase mode. Choose channel mode for each band independently (mid, side, left, right or full processing). Acon Digital Equalize 2 is available for both Windows (PC) and OS X (Macintosh). Both 32 and 64-bit versions are available, and the plug-in formats VST, VST3, AAX and Audio Units (OS X only) are supported. GUI: Good-looking if you ask me. Not as good-looking as its fiercest competitor, the Fabfilter Pro-Q 2, but not bad at all. The knobs and the rest of the controls are sized well, which makes this a joy to use. No "fiddlyness" here, as some EQs sadly have. The GUi itself is very clean in a "no nonsense" kind of way, and more sterile than Pro-Q 2's more colorful style. I also wish that Equalize, like Pro-Q 2, had a fullscreen view, but that is just nitpicking. Features: Nothing extraordinary here, but certainly powerful. It has 12 EQ bands, which should be enough for pretty much everything, The six usual filter types are present. The frequency, gain, slope, bandwidth and resonance can be adjusted for each band, and you can choose between three filter modes (minimum phase, linear phase, novel mixed phase). All this is being visualized in real-time in the neat spectrum analyzer. Another nifty feature is the optional automatic make-up gain. No complaints here. Sound: Supports sample rates up to 96kHz. Does both mono and stereo, and mid/side/left/right/full can be adjusted for each band. Clean sound which does not color the sound in any way as far as I can tell. Compatability: VST and AAX for Windows, VST, AU and AAX for OS X. Both 32-bit and 64-bit versions available. As expected from a commercial product. Other: It, like their other product Verberate, has a large and good selection of factory presets, and you can save your own as well. A nice little extra. 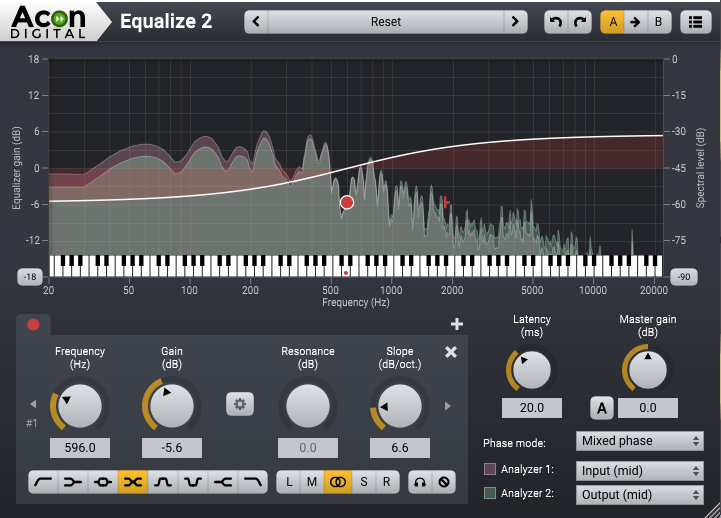 Verdict: Quality equalizer with an intuitive GUI and all the features 99% of us would need. Add a wide range of compatability and a solid selection selection of factory presets, and you've got yourself a solid pick. 9/10 from me, and a worthy cheaper alternative to the Pro-Q 2 (10/10). For more info and purchase links, check out the description right here and their webpage: http://acondigital.com/products/equalize/.